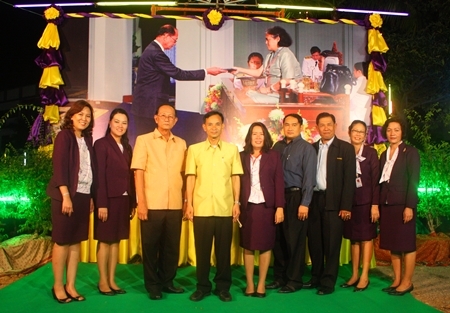 Aksorn Thepprasit School celebrated winning the HRH Princess Sirindhorn Royal Education Award honoring the Pattaya school as one of the year’s five best in Thailand. Aksorn Group Managing Director Nikhom Mohodrakhee led the Sept. 10 ceremony with Weerapong Dechbun, director of the Chonburi Primary Educational Office, and Mayor Itthiphol Kunplome. Weerapong Dechbun (4th from left), director of the Chonburi Primary Educational Office, congratulates Aksorn Group Managing Director Nikhom Mohodrakhee (3rd left) and Aksorn Group executives for their outstanding achievement. Aksorn had been selected for evaluation in May and the prize was awarded by Her Royal Highness July 23. The event featured performances from different schools and a grand procession preceded presentation of the award to Nikhom. “The royal education award is not easily achieved because there is a tough evaluation process and it is such an honor for Aksorn Thepprasit School to have earned the valuable award guaranteeing the school’s quality education system,” Weerapong said. Principal Jeeraporn Muanginth said the school excels because it focuses not only on academics, but students’ emotions, environment, intellect and societal needs. 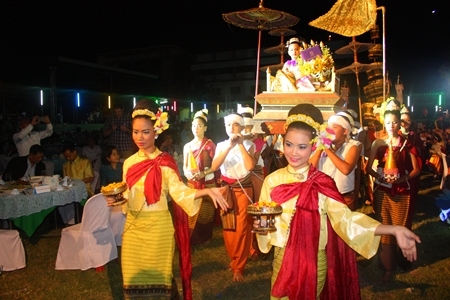 The event features performances from different classes of the school. In a grand procession, students carry in a student with the royal award to be presented to school officials.